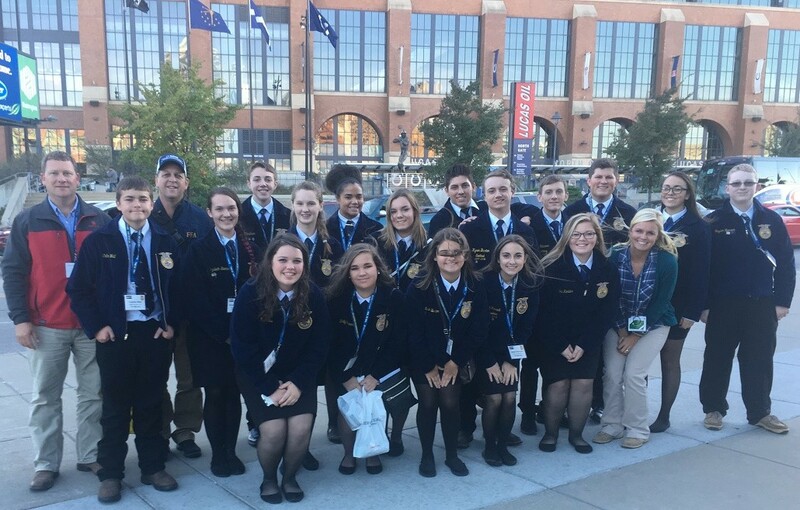 From Oct. 24-27, 17 members from the Adair County FFA chapter attended the National FFA convention in Indianapolis, Indiana. Chapters from across the country were there to meet and compare ideas with each other and learn leadership skills. Highlights of the trip included hearing motivational speaker, Leila Ali, visiting the huge career show and touring Beck’s Hybrids seed company. Adair County also placed 12th in the nation in the national quiz contest, competing against 46 other chapters ranging from Alaska to Florida. Overall it was a great trip with lots of great learning opportunities. Students attending were Coleton Wall, Elizabeth Stamper, Ty Cheatham, Susan Spinks, Kiley Feese, Shelby Jones, Emily Farmer, Ashley Hadley, Devan Burton, Kyron Burton, Dylan Hancock, Matthew Irvin, Myha Stricker, Hayden Hancock, Grant Robertson, Sarah Hancock and Tori Kimbler. Advisors and Chaperones attending were Kirby Hancock, Randy Rexroat, Mike Wall and Jessica Gaskins.